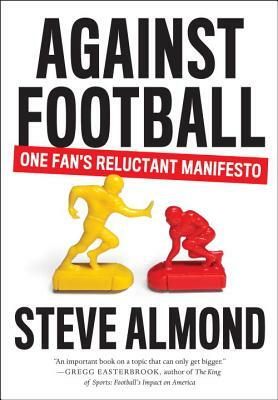 Steve Almond covers all the reasons that fans should question their devotion to the game of football. First and foremost is the debilitating effects that the repeated crushing blows have on these athletes, especially head injuries. It's not just the frequent concussions that football players suffer, but the accumulated effects of hundreds of small hits every game and practice session. Fans are watching players seriously injure themselves for their entertainment. One of the issues covered that particularly interests me is the way public taxes are used to build these extravagant arenas, only to have the team owners benefit, often moving the team to another city when it suits their financial fancy. I guess they figure it works like the trickle down theory of economics. In other words, it's just another way for the rich to stay rich and get richer. This is a well-thought out diatribe, with humor, insight and empathy. I recommend this piece of social criticism for fans and non-fans alike. • Does our addiction to football foster a tolerance for violence, greed, racism, and homophobia? leap, throw, tackle—into a billion-dollar industry? There has never been a book that exposes the dark underside of America’s favorite game with such searing candor.